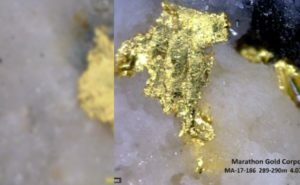 Marathon Gold Corp. [MOZ-TSX; MGDPF-OTC] has boosted gold ounces and grade at its 100%-owned Valentine Lake Project in Newfoundland. The resources were revised as part of a soon to be released preliminary economic assessment (PEA), expected in the second quarter of 2018. 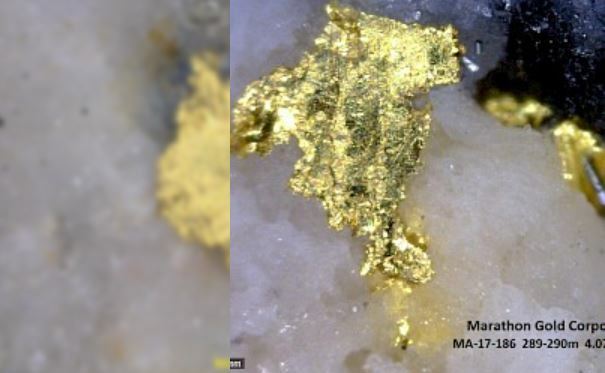 The new measured and indicated resources, covering several deposits on the property, grew to 2.1 million ounces grading 1.99 g/t gold from 1.8 million ounces, grading 1.88 g/t. On top of that is an inferred resource of 1.1 million ounces gradng 1.99 g/t gold. Marathon President and CEO Phillip Walford has been reticent to go into detail about the upcoming study but said it will be based around the new resource. Marathon is shooting for a 10-year life of mine as a basis for the upcoming PEA. Marathon Gold was unchanged at 88 cents Wednesday May 2. The 52-week range is $1.28 and 85 cents. The Valentine Lake Gold Camp hosts a multimillion ounce gold resource that continues to expand with the addition of new data. The drill fire assay results received and metallic screen assays after November 27, 2017, up until March 2, 2018 were added to the new resource. Many of these new holes were deeper and as a result there is an increase in the grade and an increase in the ounces for the underground resource with the largest increase in underground inferred to 471,500 ounces at a grade of 3.35 g/t gold. More drilling is required to define the underground potential of the Marathon Deposit. There was a small decrease in the open pit resources of the Leprechaun and Victory deposits from use of PEA level open pit design. The Valentine Lake Gold Camp is accessible by year-round roads and is located in close proximity to Newfoundland’s electrical grid. Marathon maintains a 50-person all-season camp at the property. Recent metallurgical tests have demonstrated 93% to 98% recoveries via conventional milling and 50% to 73% recoveries via low cost heap leaching at both the Leprechaun and Marathon deposits.